(...) shows us a dramatic tenor with a strong high register; his high C, for example in 'La donna e mobile' and 'Di quella pira' would be the envy of any of today's tenors. 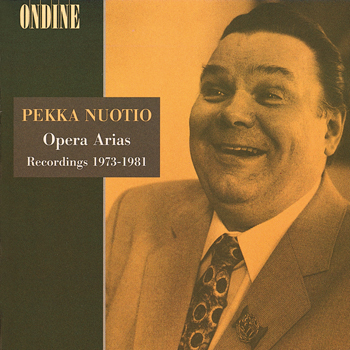 This CD features the heroic tenor Pekka Nuotio (1929-1989), one of the leading Finnish singers of the 1960s and '70s. Nuotio's repertoire ranged from Italian (with an emphasis on Puccini) to Russian and French opera and included also the heavy Wagner roles - Nuotio partnered Birgit Nilson in Tristan and Tannhäuser at the New York Metropolitan Opera from 1965-67. Pekka Nuotio did not make any commercial recording. The collection of arias on this CD has been put together from master tapes in the archives of the Finnish Broadcasting Company YLE. They portrait the great Finnish tenor during his peak time until his retiring from active singing in 1982. The recordings also feature the young baritone Jorma Hynninen as Kurwenal (17-19). The Finnish Radio Symphony Orchestra is conducted by Kari Tikka (1-11), Hannu Bister (12-14) and Okko Kamu (15-19).